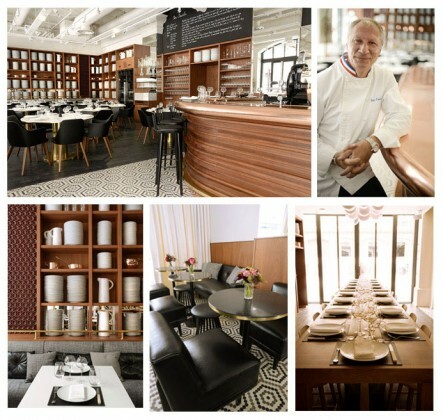 The opening of Lazare caused a huge stir: Chef Eric Frechon exited the kitchens of Le Bristol to open a brasserie in the heart of the Gare Saint-Lazare, having already launched the Minipalais at the Grand Palais. In this airy and accessible location, the three-star chef intends to democratize good food and make it available to the masses. Here, he offers authentic and generous home cooking, directly inspired by la tradition Française. True to his Norman origins, Eric Frechon highlights the best products from the region: Dieppe sole, mackerel terrine served with white wine, horseradish sauce and Paris-Deauville, the restaurant’s signature dessert. Those nostalgic for large family tables will love the “grandmothers lunches”, the anti-brunch consisting of dishes served in pots or in large friendly dishes. Conceived as a place in perpetual effervescence, Lazare boasts a warm and elegant décor where striking materials (leather, wood, copper…) occupy a prominent place in the theme. A comfortable space, created by interior designer Karen Lewkowicz.